A lively combo of organic ingredients to mix with avocado for quick, creamy guacamole. 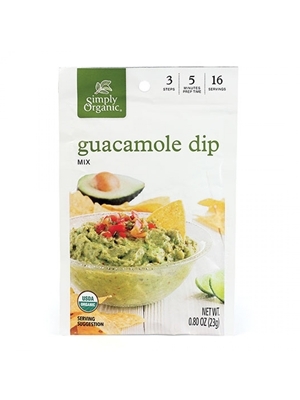 Experience the full, fresh flavor of wholesome, certified organic ingredients in this delicious dip. You will need 2 cups diced or pureed avocados. Mix the goodies in this packet with 2 cups diced or pureed avocados. Chill in the fridge for 30 minutes, then dig in. For an extra rich and creamy dip, add 1/2 cup sour cream or for an extra garden fresh dip, add 1/4 cup diced tomatoes. Potatoes Rancheros: Perfect with huevos rancheros, sprinkle Simply Organic® Guacamole Mix liberally on chopped potatoes. Fry in butter until golden. Organic Onion, Organic Nonfat Dry Milk, Sea Salt, Organic Cane Sugar, Organic Chili Pepper, Organic Garlic, Organic Black Pepper, Organic Cilantro, Citric Acid. Contains: Milk.